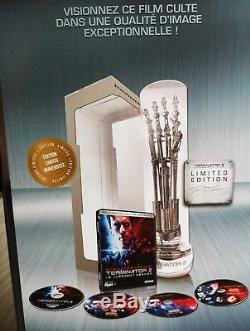 Product Description new under seal ultimate limited edition collector numbered 1500 copies contains: - a steelbook with. The ultra hd blu-ray 4k movie (new restoration approved by James Cameron). The active 3d blu-ray of the movie. 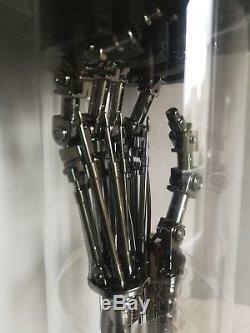 The blu-ray 2d of the movie with .. director's cut version (154'- the additional scenes are in vost only) ..
director version cut long (156'- the additional scenes are in vost only) - the cd-audio of the film soundtrack - reproduction of the t-800 endoskeleton forearm (54 cm - 3 kg). 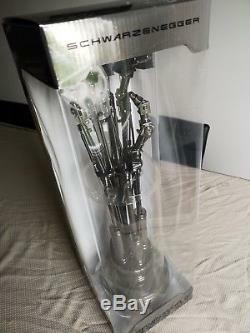 The item "terminator 2 3d edition ultimate ultimate limited edition includes arms t-800" is on sale since Monday, November 12, 2018. It is in the category "dvd, cinema \ dvd, blu-ray". Marques" and is located in / in lyon. This item can be shipped to the following country: France.